There are two major components in the charging system of our cars-the battery and the alternator. The battery has two primary functions. The first should be obvious-it supplies the power required to start the engine, and secondly, it serves as a buffer to provide additional power temporarily if the alternator is unable to keep up with momentary excess load demands. A good battery is required in order to have proper alternator operation. The alternator also has two primary functions. One is to provide the power required by the car during normal operation (ignition, fuel pump(s), fan(s), radio, and lights. The second is to maintain/recharge the battery to restore the power used during the starting process or the momentary periods when the car's demands exceeded the capability of the alternator to meet them. If the battery is not in good condition, the alternator will be overtaxed trying to charge it and this will shorten the life of the alternator. The factory alternator is more than capable of meeting the demands of the cars as delivered. If we add enough additional electrical items to the cars such as dual fans, two fuel pumps, serious sound systems, etc., there may come a time when a larger alternator is required than the factory unit, but this is pretty rare unless a serious sound system has been added. When do we need a larger than stock unit? Lately, there has been a fad created by some vendors to try to convince buyers that they need a higher output alternator than the factory unit, and tout rebuilt alternators that put out higher amperage than stock. The first thing that must be realized is that any alternator only produces the amperage required to maintain the desired voltage controlled by the voltage regulator in the alternator. Therefore, if we take the stock 120 amp alternator off the car and replace it with a 360 amp alternator, it may never put out more than something like 100 amps if that is what the various devices in the car are pulling from the electrical system. In other words, it does exactly the same job as the stock alternator, and no more. So, how do we know when a larger alternator than the stock unit is needed? First we have to determine if the stock unit is working properly and is putting out the amps listed in the specs for the unit. Our Buicks came with CS144 alternators that are capable of delivering 120 amps if needed. The factory matched this alternator quite well for our cars and it can handle the load in most instances. Factory specs are around 75- 80 amps @ idle (750-850rpms) during normal operating temps and 120amps at 1800 engine rpm (55-60mph) cruise. This can vary a little so don’t go out and buy a new one because you can only get 74 amps at idle out of yours. This is a good place to state that amperage specs for alternators are normally shown versus alternator shaft rpm. Given that the alternator pulley is smaller than the crank pulley, the alternator is turning faster than the engine rpm. This ratio may vary from car to car, but, the normal ratio range is usually between 2.5 and 3.0 to 1. On our cars, it is close to 2.8-1 when one takes the time to measure the diameters of both. This means an idle speed of 800 rpm will produce an alternator shaft speed of ~2240 rpm. Keep this in mind when looked at the graphs provided by the alternator manufacturer and don't be misled by claims otherwise. See the CS-144 alternator graphs below. Also note that the best alternator in the world will not over come wiring and connection problems. Bad grounds, corroded connectors, loose connections, too small a wire size, broken strands, etc. can all make a good alternator to be seen as bad. Further, many places are not set up to test alternators properly and an alternator that passes the test down at the parts store may not be as good as the store tells you. Many stores do not have a proper load test to correctly check an alternator. In other words, they check the voltage output when spinning the alternator and it checks out good. But if they had a load tester that would apply 100 amps to the alternator, they might find the voltage dropped to under 12 volts instead of hanging close to 14 volts as it should. Then, you know you have a bad alternator that needs to be rebuilt or replaced. In my experience, I have not found it unusual to buy a replacement alternator that is no good from the get go, either. Even some alternators that are new rather than rebuilt can fail to be good as they are built overseas with less than great quality parts. A simple means of checking the alternator is to start the engine, let it warm up and idle, then put the lights on Bright, turn the AC on and the blower fan on High, and,run the engine fan. Then put your voltmeter probe on the alternator case (make sure it is making good contact with clean metal and not paint or powder coating), and the other one on the battery terminal on the back of the alternator. This eliminates wiring and grounds. If you are seeing voltage in the high thirteens to the mid 14's, then the alternator is most likely good. If much higher than 14.4, then it probably has some bad diodes in it. This is also a good time to put the meter on AC volts and read it again. There should be less than say a half a volt of AC voltage measured. If there is more, then one of the diodes is probably bad and it is not good for the car's electronics. If the wiring to the ecm is good, normally the scan tool inside the car will read a bit lower voltage, maybe two or three tenths lower and this is normal. If it is considerably lower, then you may have a bad connection or ground somewhere in the wiring beyond the alternator. I have seen problems in the wire going from the alternator to the battery, bad connections at the ignition switch, ground cable from the battery to the turbo bracket, loose cable at the starter, corrosion in the fuse block, and so on. Here and Here are a couple of links to help you find a problem if one exists. Note that I admit that I have seen a few scan tool readings that were low and I never figured out why. Might be a problem with analog to digital conversion in the ecm, I don't know. Normally, an alternator that is failing will start to lose voltage at wide open throttle in the last part of the run as the electricals inside get hot and lose control of the regulation. If you are sure that the wiring and battery is good, then it is time to find someone that can apply a proper load test to the alternator. Heat is the biggest enemy of the alternator and you will probably notice that quality high output alternators that are used on serious sound systems have externally mounted rectifiers instead of having them inside the case...and, they may have two. They don't use these cheap garage built "high output" alternators that are often touted by those that cater to the internet unsavvy crowd. One other warning. Don't buy one of those small cased, lightweight alternators that some try to sell. They are strictly aimed at the week end racer that runs them a quarter mile at a time. Heat usually kills them very quickly if used continually. Now, let's look at the graph provided by Delco for its CS series alternators. As mentioned before, this graph depicts amperage vs alternator shaft rpm and not engine rpm. For our cars, multiply the engine rpm by 2.8 and use that number on the X-Axis of the below graph. 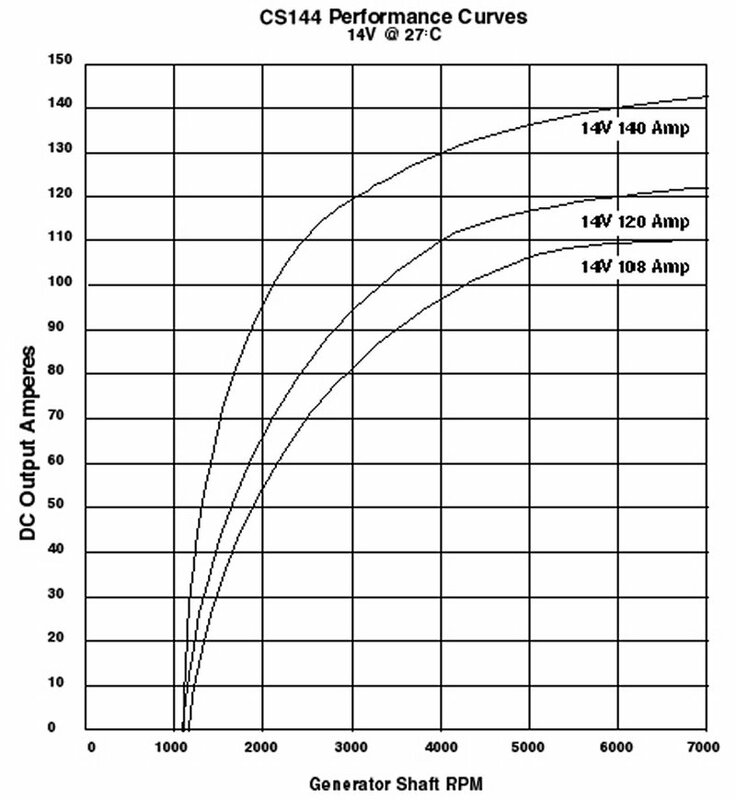 These curves show amperes vs shaft rpm at 14.0 volts. Our stock alternators are of the first generation CS144-120 amp variety. The 140 amp alternator came out in 1992 and is a revised alternator improving on some of the weaknesses in our units. This is my suggested replacement. Not because it is higher output (significantly so at idle) but, because it is just a better all around unit and is a direct replacement for ours. Looking at the above graph and taking the the 2.8-1 multiplication factor into account, we can see that a properly working 120 amp alternator should be putting out approximately 75 amps as stated prior. This means that the battery will supply additional required amperage as it was designed to do if the requirement is above 75 amps at idle. This should be adequate, and if your car is pulling a bit more than that, the battery will fill the gap. If you are in the habit of standing still for extended periods of time with a good sound system cranked up, then you may well be a candidate for a higher output alternator as the factory unit is going to be working hard to replace the power pulled from the battery when you do drive off. Your voltage reading will tell you if the alternator is struggling by reporting lower than normal voltages. If you are more typical and the above scenario only occurs at stop signs during rainstorms at night with the sound cranked up, then not enough time elapses to cause a potential problem. Remember that most system specs are rated near maximum volume and you may not normally operate in this range. Still, it is wise to do some research and determine exactly what is suggested for similar set ups and plan accordingly. If you are running an original alternator, or one with a lot of years and/or miles on it, it is probably not meeting the original specs and if you are running a lot of additional equipment, it would probably be a good idea to look at an unit with more potential output when a replacement is made. If one determines a need for a new unit, there is a factory replacement available that is ideal for most "improved" cars at a very reasonable price from most reputable suppliers. In 1992, GM made some revisions to the CS144 series and added a new model rated at 140 amps. See the above graph. Note that this unit is capable of approximately 105 amps at 800 engine rpm (~2240 alternator shaft rpm) which some 30 amps more at idle than our original units. This alternator was also installed on police cars, and fleet vehicles such as taxis where normal operation may include lots of non-moving use with heavy radio traffic. It is listed as a Lester no. 8112 which may be helpful at wrecking yards, or such places. This model is a standard stock item at major parts stores like Autozone and Napa. It is also available new online from most reputable online dealers. Prices generally range from $130-$170 although I have seen it for less. It pays to shop around. This unit is a direct bolt on when used on our cars. It will work with our wiring assuming that it is in good shape when simply being used as a stock replacement. However, if one has a strong sound system, or some other add-ons that pull a lot more current, then one should definitely upgrade the wire from the alternator to the battery with a larger gauge (something in the 2-6 gauge range). John Spina of Caspers Electronics offers such for our cars. In fact, I have noted a high resistance problem with a number of our cars in this cable as they get older. Probably a good idea to replace it no matter what. You can make your own, if you like. Given that the price of a brand new unit is not much more than a factory 120 amp replacement, I believe this is the logical choice when replacing a bad factory unit. My first preference would be to check with Pick-a-Part and see if I could get one for $50, or less as most should have several years of life left and parts are readily available for a rebuild if, and when, it needs it. Alternators are easy to rebuild. That should be kept in mind. Make sure you understand that a 300 amp magic alternator does not put out any more amps than a factory 120 amp unit unless the car has something installed that demands the power. Alternator rating is meaningless unless there is something installed that will actually pull the current. On a normal car with normal equipment, the only thing that a mega-huge alternator does is create a large draw on your bank account. Now let's finish with the exotic ultra high amp alternator systems. We all know they are commonly used on ambulances, emergency vehicles and 2000 watt ricer stereo systems. As mentioned above, you need to figure how much amps you need. You just can’t see a 240 amp alternator in a magazine or webpage and say, “That’s what I need”. First, chart out all of your equipment. Then add this to the basic given load mentioned earlier. If your using 80-120 amps now you will only have 120 amps left on a 240amp alternator. Most idle specs I see are between 110-160 amps. Higher would be the more expensive commercial units. Many all out stereo systems can draw 100-200 amps alone. See a problem here? You need to hit the car stereo WebPages and ask the gurus what system you will need to operate effectively. I see many of those guys with two and three alternators and two batteries. One of the reasons is high amps create high heat. That will destroy a high amp alternator with a small case. Emergency vehicles use special CS 144 units with external extreme duty dual rectifiers to handle the load. This is on 250 amp or higher alternators. There is a reason for this. It is to combat heat which is the primary killer of alternators and the rectifier is usually the first thing to go according to the experts. If you have a serious system in your car, then consult the stereo gurus and pick one that will live in your application.